Top “Republicans In Name Only” are on notice, as conservatives across the country will cast their vote for Republican politicians most deserving of a RINO award. 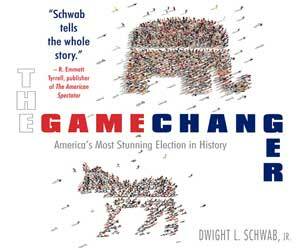 After losing Congress in the 2006 election, and the Party possibly facing the loss of the White House in 2008, conservatives are less than enthusiastic about their representatives and potential Presidential Candidates in the upcoming elections. Fed up with excessive spending, amnesty for illegal aliens, and weak positions on family values and abortion, Conservatives across the country are frustrated that their voices have fallen on deaf ears. Until now. We the People for President created a website for conservatives to vote for their favorite RINOs (Republican in Name Only) who have abandoned certain core beliefs of conservatism, and will bestow upon them a “RINO Award.” The Top RINO Awards are the first of their kind, where We The People across America, ourselves, will determine who receives an actual RINO award. Unable to check a “You Blew It” box at the voting booth, frustrated conservatives can now simply click on their favorite RINO to cast their vote, sending a message to top Republicans that the RINO is now an endangered species. This is an opportunity for We the People’s voices to be heard. No public figure has the courage to call attention to the Republican Party, which has been conspicuously negligent in rooting out entrenched politicians, for their liberal positions on issues. The RINO awards are designed to highlight specific and crucial conservative issues that a Republican politician has abandoned. Issues such as abortion, political corruption, illegal immigration, over-spending and lack of defending the core conservative values that tug at the hearts of the conservative base, many of whom are considering staying home in future elections. These core conservative issues are what separate the elephant from the rhino; that is, true Conservatives from liberal Republicans. Votes from across America will be tallied and a top RINOs will be periodically announced for their stance on specifics issues. RINO winners will be presented with a beautiful gold rhinoceros, adding a special touch to their plush homes or offices. While America votes, Republican officials who have ignored their base will be on alert, as votes are tabulated instantly. Voters are able to immediately see their votes count and watch the competition unfold on their computer screen. In the spirit of free speech, voters also have the cathartic opportunity to post their comments addressing why they have selected their favorite RINO, as well as the opportunity to nominate other RINOs. For example, some voters have suggested awarding RINOs to Presidential Candidate Rudy Giuliani for his stance on abortion and Senator John McCain for his vote on amnesty. Americans also have the chance to vote for special titles to award the contenders, such as Most Likely to Have a Barak Obama Poster in their Bedroom and Most Likely to Limo an Illegal across the Border. The current nominees are Senator Jon Kyl (AZ), Senator and Presidential Candidate John McCain (AZ), Senator Mel Martinez (FL), Senator Larry Craig (ID), Senator Richard Lugar (IN), Senator Olympia Snowe (ME), Senator Trent Lott (MS), Senator Chuck Hagel (NE), Senator Judd Gregg (NH), Senator Arlen Spector (PA), Senator Lindsey Graham (SC), Senator Bob Bennett (UT), Governor Arnold Schwarzenegger (CA), Presidential Candidate Rudy Giuliani and Presidential Candidate Mitt Romney. In 2000 I voted for President Bush and the Republicans. I had high hopes that with the Republicans in control of the legislature and the executive branches that real change would occur in our government. I thought that the principles that we all thought the Republicans stood for would guide the Republicans to do what is best for the country. I thought I would see a new higher moral standard. What we got was corruption, bribes, moral decline, hearings with no action, tax breaks for big business, McCain Feingold and last year 15,000 earmarks. We get a Republican majority in the Senate and a President who think that the best way to handle the illegal alien problem is to give them amnesty. And just last month we had a great breakthrough with the North Koreans where they agreed to not do what they agreed to not do under Clinton. How much will it cost the American citizens this time? There has to be a change in Presidential and Congressional leadership to affect change in this country. There has to be a way to get the politicians out and the statesmen in. Those politicians who vote only for the sake of the party, the lobbyist or big business have to be removed. To bring about substantial changes in the government these new statesmen must control the House, Senate and the White House. Born 1946 in Winston-Salem, NC, married with two grown children, daughter and son, 4 grandsons and 2 granddaughters, businessman, member of Biltmore Baptist Church, Asheville, NC, dad owned a small trucking company-passed away 2002, Mom worked as a cafeteria worker-passed away 1989, Eagle Scout, grew up on a farm in rural North Carolina, worked hard and long in the hot and the cold. Milked cows, slopped hogs, fed chickens, etc, graduated in 1969 from Virginia Tech with a BS in Civil Engineering, Army ROTC commission Stationed at Fort Bragg, NC, Fort Jackson, SC and Vietnam, Black Mountain Center Human Rights Advocacy Committee. 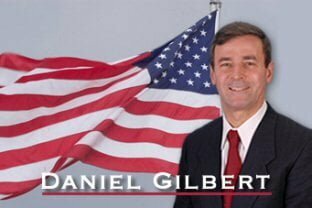 Daniel Gilbert is a conservative politician and conservative political commentator, who graduated in 1969 from Virginia Tech with a BS in Civil Engineering. Born 1946 in Winston-Salem, NC, married with two grown children, a daughter and son, 4 grandsons and 2 granddaughters, businessman, member of Biltmore Baptist Church, Asheville, NC, dad owned a small trucking company-passed away 2002, Mom worked as a cafeteria worker-passed away 1989, Eagle Scout, grew up on a farm in rural North Carolina, worked hard and long in the hot and the cold. Milked cows, slopped hogs, fed chickens, etc, graduated in 1969 from Virginia Tech with a BS in Civil Engineering, Army ROTC commission Stationed at Fort Bragg, NC, Fort Jackson, SC and Vietnam, Black Mountain Center Human Rights Advocacy Committee.